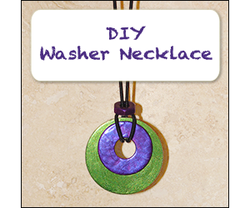 A DIY washer necklace tutorial using objects found around your home. My daughter wanted a 'cool necklace' for her birthday a few years ago. After looking at hundreds of cheap necklaces at the mall I was uninspired. They were ok, but I ended up going home empty handed. The same day, while browsing Pinterest, I got bitten by the bug to make a one-of-a-kind washer necklace. I saw a lot of different styles and had an idea of what I would do. I just needed to get cracking and find what I needed. There wasn't any time for shopping so I had to get creative. This was a spur of the moment project using pieces I found. It was after dinner time, the night before my daughter's birthday. First I went next door to look through my Father-in-law's basement. He has jars and jars of screws and whatnot, but I couldn't find one for washers. But I found one single washer in a junk box that would be perfect. Back at my house I asked my husband for some of his random hardware parts and found another single washer that was smaller. Just what I wanted. I also sorted through my daughter's beads looking for an accent piece, but they were all too small so I decided to use a nut. Now what could I hang it on? I asked if anyone had a leather shoelace, nope. Looked at my daughter's craft string... too thin and I wouldn't have time to braid it. I was searching through drawers and cubbies, and finally in my grandmother's old sewing box. I found black elastic cording. Jackpot. I painted the bottom of the pieces once, and gave the top two coats each. Once they were dry I looped the cording through the two washers, slipped the nut down, and tied the cord at the top. You can see a closeup below, minus the nut. A deep purple with blue toned simmer. 5 yards (180") of light stretch elastic cord. So, mine was a very simple example. If you have more time, and can go to a craft store to choose embellishments, you can do so much more than what I've shown you. I've seen some beautiful decoupaged washer pendants using scrap book paper and Mod Podge. Some have intricate wire wrapping, bead work, or charms. Others use multiple washers in a row. If you have the tools you can personalize the pendants by stamping in text. The necklace itself is up to you too. A few easy ideas are leather, ribbon, or a chain. There are tons of washer necklaces on Pinterest. I started a board just to pin my favorites. You can see them here. What a great idea, especially since I have an assortment of stray washers in my toolbox! Thanks. The video was helpful too. Are you new to metal clay? Metal clay is a clay form of precious metal that you can use to create jewelry. Metal clay is available in gold, silver, copper, and brass. Here I'll present some of the basics of making your own beaded jewelry: tools, materials and where to learn simple techniques to get started.